Who are SIM and Sports Friends? I recently read something that really got me thinking. The article is short, but powerful. It’s about busyness, a sneaky adversary I know many of us struggle with, and the importance of intentionally leaving some margin in our lives to make space for the unexpected. If it sounds interesting or relevant, I’d recommend checking it out if you have a second. The rest of this post builds on what I read there first. My training period for Sports Friends started in early September and will wrap up in about four weeks. Most of this time has been spent completing development activities, along with beginning the vital work of building a financial support team. I’ve also been taking on some substitute teaching. All of these things are important and some have been stressful at times, but the season I’m in right now definitely doesn’t compare to the consistent busyness of my former professional life as a teacher. Over the past couple of months, more than once I’ve found myself facing days of wide-open space with nothing concrete on my schedule. Interestingly enough, rather than embracing the margin this season has naturally graced me with, I’ve felt ashamed of it. I, like so many others, have almost always suffered from chronic over-commitment. Instead of viewing margin as valuable and needed, I tend to approach it with caution, wondering if having extra time in my life somehow makes me a slacker or an underachiever. Sadly, because I’ve always equated busyness with capability and success, non-scheduled time often makes me feel nervous and antsy. Isn’t there something I should be doing? I don’t think I am alone in this. Our society as a whole applauds plate-spinners. 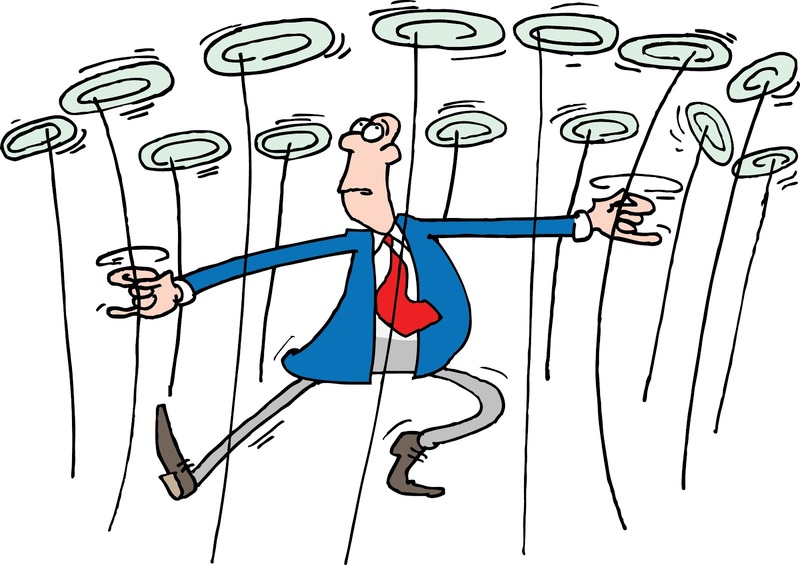 The more plates you manage to spin without dropping, the more valuable you become. This faulty logic rears its ugly head in all areas of life – as a student, as a professional, as a parent (or so I hear), etc. The world’s respect typically goes to those who take on the most; bonus points if you can make it look easy. The praise you receive as a plate-spinner is, unfortunately, like putting a band-aid on a bullet wound – great for just a second, but then you desperately need more. It won’t sustain you through the madness. I know this from experience, and, honestly, I’m tired of living this way. When I take on a lot, I may look capable or admirable to outsiders, but on the inside I know the truth: I’ve purchased a one-way ticket to Crazy Town. And it’s non-refundable. Rather than spinning lots of different plates, what I really want is to do just a few things and do them really well, leaving a sizable amount of margin for rest and unexpected opportunities. In order for that to happen, I know I’ll have to make some intentionally difficult and unpopular choices to forgo the things that make me feel accomplished for the things that make me feel full (there’s a difference). I know everyone has real-world responsibilities. I’m not suggesting that we all quit our jobs and stop making dinner and doing the laundry just so we can have some margin. I’m simply wondering what it might do for our souls, for my soul, if we changed a few of our yes’s to no’s and planned deliberately for margin the way we plan for everything else. I know it sounds cliché, but at the end of our lives it really won’t matter how many plates we spun or how many tasks we were able to accomplish on any given day. What will matter is the love we gave. Heading into the holiday season, my word is margin. Instead of feeling ashamed of the margin already afforded to me in this season of life, I’m ready to embrace it. I won’t make a mockery of it by over-scheduling it or wishing it away. That way, when unexpected opportunities arise, I’ll be ready to love people well instead of grumbling about having to add one more plate. Ashley, this is precisely where I am right now. I feel the urge to take on everything so I am “succeeding” in this world, yet I have proven to myself already this year that if I try to do it all I enjoy and am edified by so much less. So I just refused a neighborhood board nomination (little twinge of guilt, but only little). I know I cannot be present for the people in my life the way I want to be when I hit the scurrying, overload mode. Also, I often refer to myself as a plate spinner and warn my work team when china is likely to crash (ha!). That does amuse me, but I can very truly feel the stress of not knowing where that wobbliest of plates is. I am actively seeking inner quiet time for presence with God and the margin in life so that I don’t feel like I am just getting by and checking things off my list. Thank you for sharing your perspective and where you are in your journey.